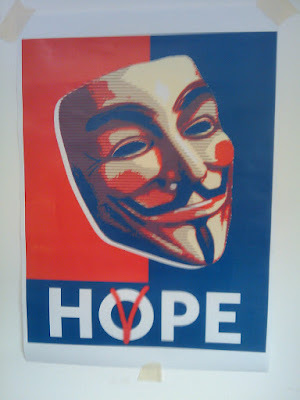 Anyone who's seen "V for Vendetta" should be at least mildly amused by this photoshop I found online. Republicans will probably love it. Democrats, not so much. For me, it's not a matter of party, but principle. Both the Democrats and the Republicans have worked tirelessly to strip us of our rights "for our own protection," one of the central premises in "V for Vendetta." I will be attending the inauguration on Tuesday, not as a fan of Obama, but as a fan of our Republic and the peaceful transfer of power from one oligarchic clique to another ... and in constant HOPE that one day the power will return to the people. I actually had someone tell me that it's not right that I would go to the inauguration becuase it's like I'm "hopping on the (Obama) bandwagon." In this person's scenario, you can only celebrate the installation of a new president if you voted for that person. So only Democrats and Republicans may celebrate this once-every-four-years party. Libertarians such as I, will never be allowed to celebrate because we're minimized by the press, the board of elections, and the media, ensuring that we'll never have our own president ... barring a miracle or revolution. Of course, I'm all for a revolution ... but not the kind in "V for Vendetta," although, to be fair, the real revolution in that movie wasn't the killing of government officials or the blowing up of buildings, but the light that went on in people's minds reminding them that, "oh yeah, it IS our country, dammit." We need that sort of thought revolution. The one where we remember that government is an extension of us ... and not our master. It's somewhat fitting that a black man would become president and pay homage to Abraham Lincoln, putting an exclamation point on the ending of slavery, which happened 130-plus years ago. But at the same time, in 2009, we're all slaves ... slaves to a bloated tyrannical government that was advanced by the same Abraham Lincoln that Barack Obama is paying homage to. But I continue to HOPE ... that we'll be freer tomorrow than we are today. Bush declares "War on Birds."